The spirit of rock music is the same today as it was when rock & roll was born! Artists like Jerry Lee Lewis, Little Richard as well as the King of Rock himself, Elvis Presley pioneered a genre of music that spoke to young people in diners and drive-ins around the country. 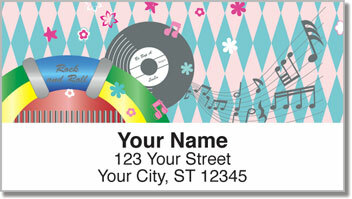 1950s Rock and Roll Address Labels are a cool choice for all sorts of music lovers, whether you like Rockabilly and Doo Wop or Heavy Metal and Punk Rock. These retro-themed labels will remind you that as long as rock keeps pushing the limits - it will never die! 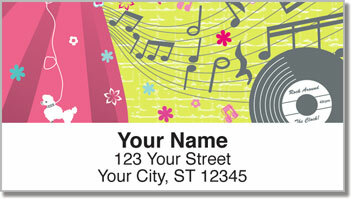 Use these handy labels and you'll never have to scribble your name and address on an envelope again. Now that rocks! 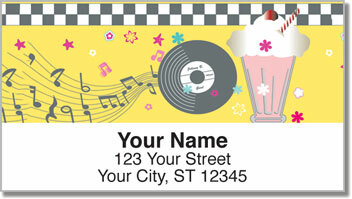 Get your own 1950s Rock and Roll Address Labels today! 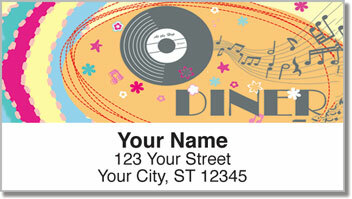 You'll also find this classic design in a set of matching personal checks.